Today's top enterprises look to achieve a competitive advantage by deploying enterprise portals within their IT infrastructure. JBoss Enterprise Portal Platform provides an integrated open source platform for hosting and serving a portal's web interface, aggregating, publishing, and managing its content, and personalizing its experience. The JBoss Enterprise Portal Platform Subscription includes JBoss Portal and JBoss Enterprise Applicatin Platform. Building upon the JBoss Enterprise Application Platform Subscription, the JBoss Enterprise Portal Platform enables custom, personalized under interaction with your businesses applications and SOA deployments. The JBoss Enterprise Portal Platform is updated based on the defined Product Update and Support Policy and each integrated component is supported for development and production use according to your subscription agreement. As part of the JBoss Enterprise Portal Platform release process, a number of JBoss.org components may be added or removed for dependency or compatibility purposes, while other components may be included as Technology Previews. 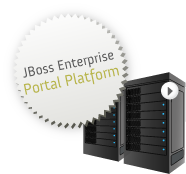 The Portal Platform adds JBoss Portal 2.6 to the JBoss Enterprise Application Platform. Please read the Application Platform Component Details page for a listing of all components in each Application Plaform release. JBoss Portal Platform provides a framework for centralized and secure access to applications and information, which fosters collaboration, streamlines business processes, and reduces costs. Since JBoss Portal Platform is based on open standards, it can incorporate components into the portal as standardized and reusable portlets. So it meets the needs of business to employee, business to customer, or business to business portals. JBoss Portal Platform is based on the market-leading JBoss Application Server, so access to dynamic information is simple. Performance and scalability are assured. By providing an integrated user interface across applications, JBoss Portal Platform makes it easier for users to leverage existing IT applications, increasing return on investment of IT assets and reducing the need for new application and integration development.